Community college students are central to the goals of the Obama administration, many governors from both major parties, foundations and others to increase the percentage of the adult public with college credentials. Not only do a plurality of college freshmen start at community colleges, but those students are more diverse and more disadvantaged than others. This makes community colleges crucial not only to overall college attainment goals, but to related goals to diversify the student body nationally. But success in these goals is far from assured. At many community colleges, completion rates are low. Remedial needs are high. As a result, colleges are currently working on a variety of strategies – involving orientation, registration deadlines, assessment, the curriculum and more – to promote student success. Inside Higher Ed editors Scott Jaschik and Doug Lederman discuss these issues in this free webinar. Click here to download the accompanying slide deck, and visit insidehighered.com/booklets  to download The Quest for Student Success at Community Colleges, a free booklet of news articles on this important topic. 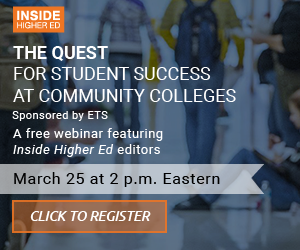 Inside Higher Ed's "The Quest for Student Success at Community Colleges" webinar is made possible with the support of ETS, a leader in higher education assessment. The SuccessNavigator® assessment from ETS helps colleges and universities reach at-risk incoming students and improve retention and completion rates as early as their next incoming class.